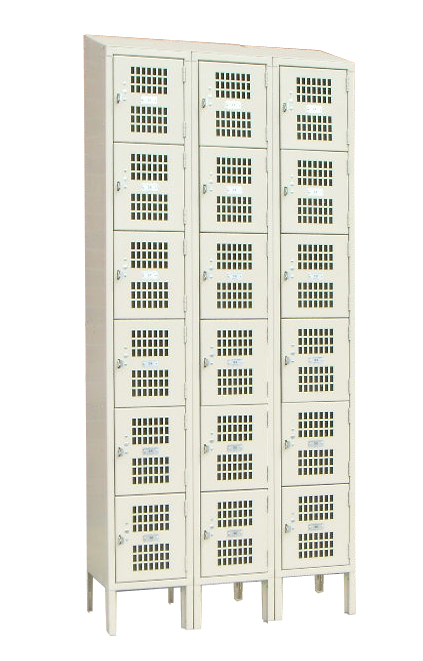 These Vented Box Lockers - Multi Tier are available on www.buyusedlockers.com where they have a huge selection to choose from if we need additional supplies. Offering Premier 5 and 6 tier vented box lockers in 24 colors to help you to store whatever you need stored! These offer great air circulation and are perfect for facilities with "fragrant" materials (gym clothes or shoes, lunches, damp towels, etc.) that need to be secured. Fitness centers, gyms and offices will benefit from using these to protect items from pilferage and if those “fragrant” materials are left for an extended period of time they won’t immediately start growing mold and mildew. With the perforations in the doors, hiding items that are against your policies is nearly impossible. Instead of opening each compartment for a locker check, you can just peer in through the ventilated door! **12" wide x 15" deep x 72" tall IN STOCK in three tier and available for quick ship in popular colors beige and gray from all our locations across the nation! Quick ship units generally ship within 3 to 5 business days un-assembled or 5 to 7 business days assembled (often sooner). All other sizes and colors available on a production schedule with varying shipping times. Large quantities may be eligible for a discounted price. Custom sizes, styles and colors available upon request. Contact us for more information.